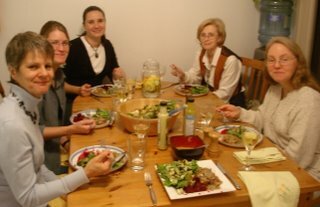 Cooking Delights: The FIRST cooking class! Well we did it! 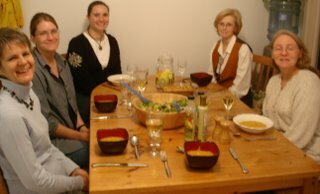 With the help of my family and the lovely ladies who joined me this evening I have officially run my first cooking class. I must apologize that I did not take more pictures. I had meant to take more pictures of the process of people cooking but I only remembered about taking pictures after everybody had sat down for dinner. So, here we are enjoying our soup. This was the most delicious squash and yam soup from The Everyday Vegan. Here we are enjoying the main course. And, this is the main course. 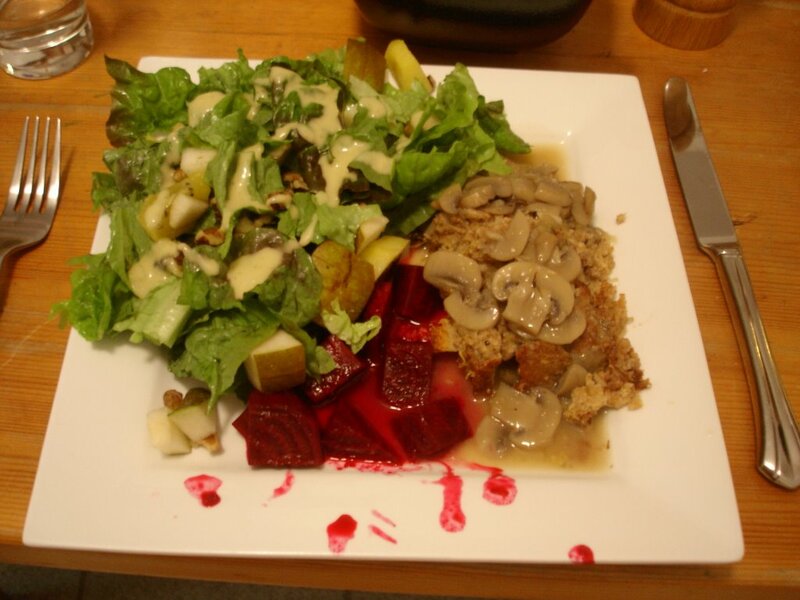 Nut loaf drizzled with mushroom gravy, orange glazed beets and a simple green salad. I will definitely do this again, but not until my the New Year. Right now, all my focus and energy is on getting my dissertation handed in to my external committee by the end of the month and then on my actual defense the first week of December. After that, I will be a free woman, and much more fun to be around! BTW, I'm not actually in any of the photos since I was taking the pictures! Oh, and I apologize for the blurry photos, I guess I wasn't holding still enough. You held a cooking class?! Wow! That's impressive. My apt. sized kitchen will accommodate two people confortably. Add one dog and it gets a bit cramped. Congratulations! Looks like it was a rousing success! I've e-mailed Kleopatra. Will get in touch with you when I hear back. Looking forward to meeting you, Melissa; thank you for your post on my blog and also your e-mail. I'm sorry to say that i am under the weather in a big way right now, and not exactly looking forward to the long flight... but happy to get out to see my family there and YOU as well, i hope hope hope! I would love to take a cooking class, but unfortunately for me, there aren't that many good-sounding ones around me. I would also love to give a cooking class, but I don't really think I'm qualified. congrats...looks like everything went well and everyone is smiling! Now, hit the books! So glad it was a success! I knew it would be... Hope everything goes well for you in the coming weeks! Well done with the cooking class!! That is such a cool thing to do, and I bet your group learned a lot about foods and new ingredients...? Good luck finishing your dissertation! Congratulations, Melissa on your first cooking class -- how exciting! :o) Best of luck finishing up classes & becoming a free woman. Cheers!